Description: Zalalovo is a small town near Zalaegerszeg (Western Hungary), 3,200 inhabitants. It was already inhabited in Roman times (Municipium Aelium Salla). St. Ladislaus parish church was built in 1925-27, the site of the destroyed old church. The priest is very active in his evangelical message reaches 100,000 people a day via email. During the communist era, the Hungarian organ production is almost completely eliminated. The last years of communism revived the old factories. 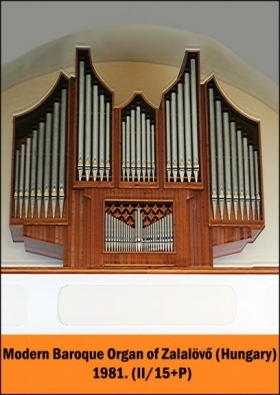 The church organ was made by the Budapest Aquincum organ factory in 1981. The disposition of the small neo-baroque organ by Prof. Gergely Ferenc.